I don't have an anecdotal story to accompany this recipe. Sorry, fresh out of something interesting to tell you. So, let me just share this evening's dinner with you. It's really simple, but does require thinking ahead. I always make the dough at least the night before, and grill the BBQ chicken when we've got something else going on the grill. 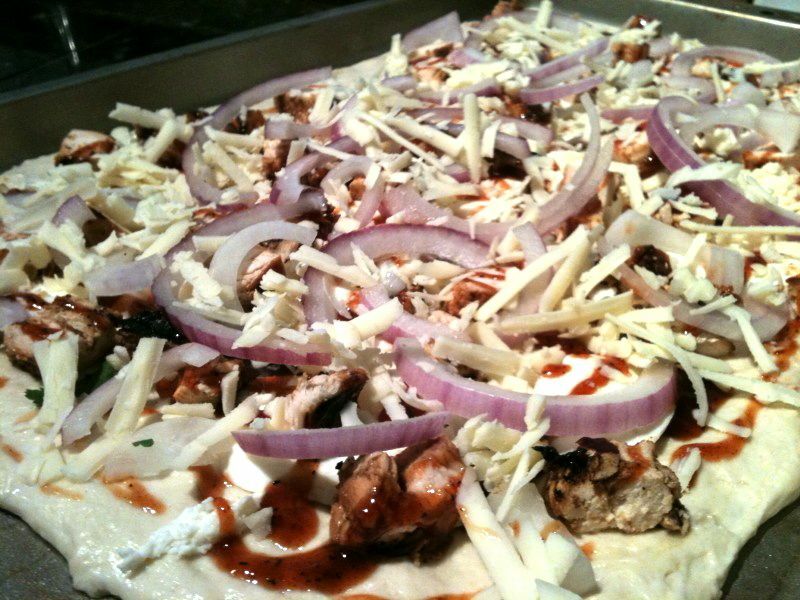 I rely on this pizza to be a quick dinner, so I have to think ahead. 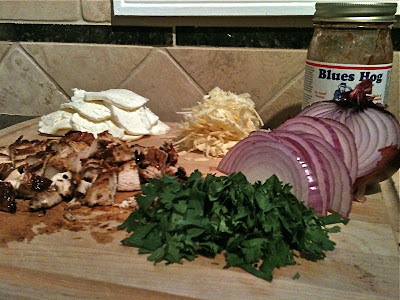 Of course, if you want to start dinner 3 hours before you want to eat, go ahead and start the dough that day and cook the chicken while the dough's rising. And then you'll get a gold star. I got lazy at the end of the night last night, so I didn't wind up making the pizza dough ahead of time. I picked up some rapid rise yeast on my way home from work today in order to remedy that. It worked just fine! I love Blues Hog BBQ sauce. 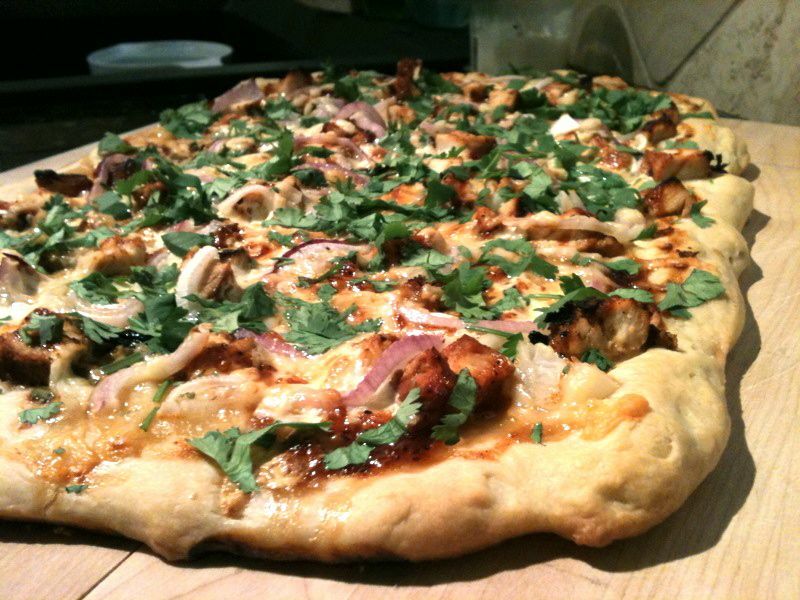 This pizza's made up of mozzarella cheese, cheddar cheese, red onion, BBQ chicken, and cilantro. 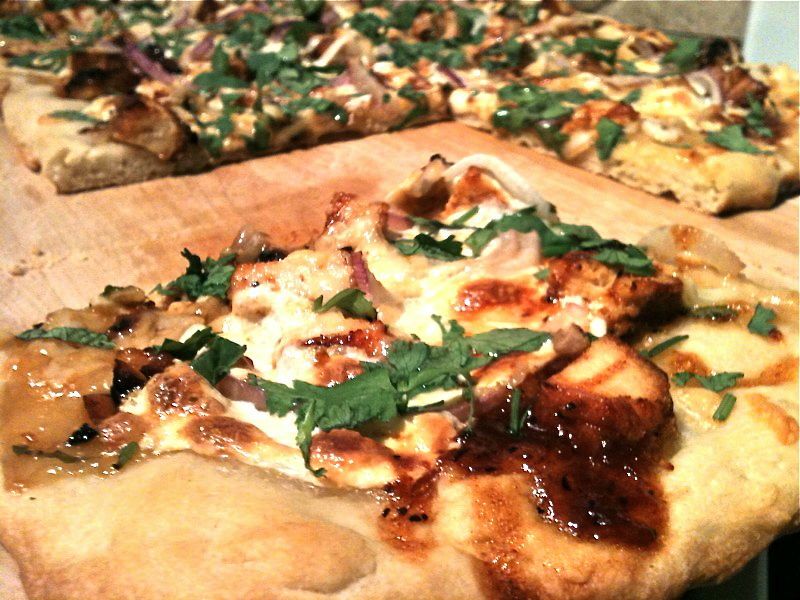 Stretch out your pizza dough on a cookie sheet, or a pizza stone if you're a cool kid. Spread a thin layer of BBQ sauce over the crust, then layer on the mozzarella cheese, chicken cubes, red onion, and a little bit of cheddar. The chopped cilantro is added right after the pizza comes out of the oven. Sprinkle yeast over warm (not lukewarm) water. Let stand for a few minutes. In a mixer, combine flour and salt. With the mixer running on low speed (with paddle attachment), drizzle in olive oil until combined with flour (you can also just use a fork). Next, pour in yeast/water mixture and mix until combined, and the dough comes together in a sticky mass. 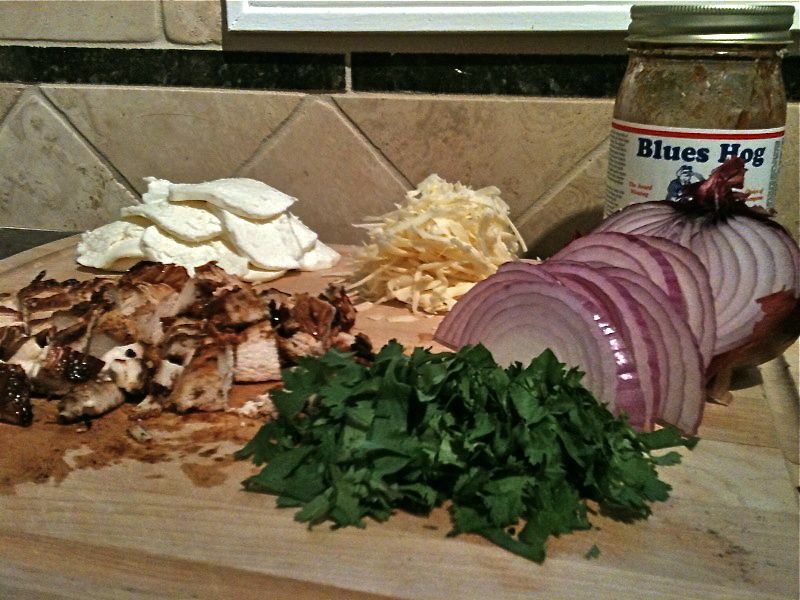 I made this for Ryan and I tonight...amazing :) Blues Hog is now on my BBQ list ... never heard of it until now.